In the 1970s, on a vast prairie near Batavia, the U.S. government built a particle accelerator called Fermilab, to help scientists answer the deep, puzzling questions of the existence of the universe. Since that time, many questions have been answered, but some remain: Are there undiscovered principles of nature? Are there extra dimensions of space? How did the universe come to be? Deep in the heart of Fermilab’s sprawling 6,800-acre complex, particle physics scientist Doug Jensen stands in a converted barn, wearing a kilt, green-ribboned knee socks and a T-shirt that poses yet another question: Why jog when you can jig? The answer is easy for Jensen and the other Scottish dancers who gather each Tuesday to trot the night away: it’s fun. A Fermilab physicist by day, Jensen teaches Scottish dance by night, to a group known as the Silk & Thistle Scottish Dancers, inside Fermilab’s Kuhn Barn. 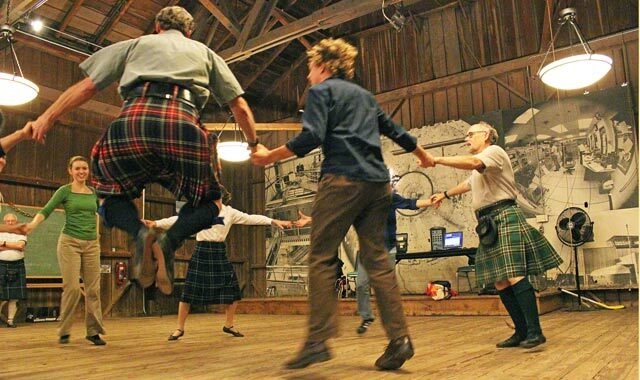 With the help of fellow instructor and particle physics scientist Mady Newfield, Jensen and the dancers pursue the patterned principles of Scottish country dance. On this Tuesday dance night, members and guests arrive at the barn, deposit snacks on a table, chitchat with one another, and start warming up. Beginners are given an orientation so they’ll know some basic steps, and the group generally starts with a less complicated dance. It’s often a strathspey, a slower, elegant style originating in Scotland around the “strath” of the River Spey, a place also famous for Scotch whisky. After that, it’s on to more complicated strathspeys and other dances, and the dancers talk and walk through the more difficult steps before the music begins. Later on, Jensen was working at the European Organization for Nuclear Research (CERN), Fermilab’s counterpart in Switzerland. While there, he learned Scottish dance from a group of expats, while Newfield, who worked at CERN around the same time, joined a different international dance group. Jensen eventually traded Geneva, Switzerland, for Geneva, Ill., where he once again found himself working with Newfield at Fermilab. Now, the two also work together out of the Kuhn Barn, each assisting the other with individual dance groups. Halfway through the Tuesday evening class, a break for a snack and some socializing is followed by more dancing, sometimes with different partners. Up-tempo music picks up the pace for reels and jigs. Smiles abound, and an occasional whoop goes up from the dancers, who stride in great circles and jump into the air. Bagpipes seem a natural accompaniment to Scottish dance, but at events in which live music is played, it’s more likely to come from an accordion, fiddle or piano. Fitak has been with Silk & Thistle since the early days of Fermilab, and he’s not shy about wearing a kilt to class, even in the dead of winter. Fitak is mostly of Polish descent, so his love of jigs and reels isn’t inherited. As a computer analyst by day, however, he seems to fit into a common belief that the Scottish steps appeal particularly to math and sciences people. “That seems to be the type drawn to this dance,” he says. He insists that Scottish dance has universal appeal. The group brings together people of various ethnic backgrounds and includes ages high school to senior citizen. Often, group members enjoy more than just dancing. Flirty or not, the dancers also like to put on a good show, displaying their skills at the Museum of Science and Industry’s Christmas Around the World event, and various others, from Milwaukee to Valparaiso, Ind. Regardless of where they dance, it’s really all about the fun. “This is social dancing,” says Newfield. This entry was posted on Wednesday, June 27th, 2012 at 11:59 am	and is filed under Arts & Entertainment. You can follow any responses to this entry through the RSS 2.0 feed. Both comments and pings are currently closed.